This is the much-loved classic tales of Ratty, Mole, Badger and Toad. When Mole goes boating with Ratty instead of doing his spring-cleaning, he discovers a whole new world. As well as adventures on the river and in the Wild Wood, there are high jinks on the open road with that reckless ruffian, Mr Toad of Toad Hall. Ratty, Mole, Badger and Toad become the firmest of friends, but after Toad’s latest escapade, can they join together and beat the wretched weasels once and for all? 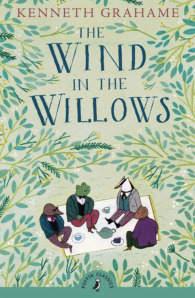 “The Wind in the Willows” by Kenneth Grahame is one of the twelve wonderful classic stories being relaunched in “Puffin Classics” in March 2008. Kenneth Grahame, the third child of Cunningham and Bessie Grahame, born in Edinburgh at 32 Castle Street on 8th March 1859. When Kenneth was barely a year old his father obtained the post of Sheriff of Argyll and the family moved from Edinburgh to Argyll. At first they lived in Ardrishaig while a new house was being built for them. The building lasted more than two years and the family also lived a few months in Lochgilphead before moving into their new home in Inveraray. Their enjoyment of their new home was short lived. Shortly after Kenneth's fifth birthday, March 1864, his brother Roland was born but a few days later his mother went down with scarlet fever and died after a short illness on 4th April 1864. Kenneth himself also went down with the same illness and struggled with it for several weeks before he recovered. During his illness Granny Inglis, Bessie's mother, came from her home in Berkshire to Inveraray to nurse the child. After Kenneth's recovery it seemed clear that his father, who had succumbed once more to an old drinking problem, would be unable to look after the four children - Helen, Willie, Kenneth and Roland. The children moved to The Mount in Cookham Dene, the home of Granny Inglis. Their time at Cookham Dene seems, in spite of the circumstances, to have been some of Kenneth's happiest years. The Mount was a charming old house with an attic and a large garden in which the children could play. The majestic Thames river was nearby, fostering in Kenneth a lifelong love for the river and boating. But at Christmas 1865, after living less than two years there, the chimney of the house collapsed and the children moved to Fern Hill Cottage in Cranbourne. This was a smaller house some miles away from both Cookham Dene and the Thames. During their time at Cranbourne their father made an attempt to overcome his drinking problem and arranged that the children would return to live with him in Argyll. The children spent most of the year of 1866 back at their former home in Inveraray. In the end their father relapsed into his old ways and left his children, his job and Argyll, to move to France. (It would seem that there was no further contact between Cunningham Grahame and his four children for the remaining twenty years of his life. Cunningham Grahame died in Le Harve in 1887 and Kenneth was the only one of his children to attend the funeral.) The children returned from Argyll to Cranbourne and Kenneth lived there until he started school at St Edward's in Oxford in1868, at the relatively late age of nine years old. His account in the essay he wrote in later life, Oxford Through a Boy's Eyes, would seem to indicate that he attended St Edwards in the years while it was still in New Inn Hall Street and also attended the new school which opened on the Woodstock Road. His early years at school were a challenge but, by the time he left St Edward's, he achieved numerous academic and sporting accolades - Head Boy, captain of the Rugby XV, the Sixth Form Prize, the Divinity Prize and the Prize for Latin Prose. Undoubtedly Kenneth had the academic ability to study at one of the Oxford universities, and it was his dream to do so. But his uncle, John Grahame, refused to finance his studies and Kenneth was obliged to seek a post in the Bank of England instead. He worked in the family business while waiting for the post in the bank to become available. Kenneth lived at Draycott Lodge in Fulham with another uncle, Robert Grahame, in this period. Interestingly, Kenneth sat an entrance exam for the Bank of England and received full marks in the English essay paper. This result was an unheard-of feat in the bank's history, both before then and afterwards. Two years later the post in the Bank of England became available and in January 1879 Kenneth took up the duties of clerk at the bank's headquarters in Threadneedle Street in London. As Draycott Lodge was quite a distance from the bank Kenneth also moved to lodgings in Bloomsbury Street around the same time. During his early years in London, and even before beginning to work with the Bank of England, Kenneth became acquainted with some leading literary figures and began to socialise in literary circles. His own writings were kept fairly secret at first, with a few essays being published under a penname in St Edward's Chronicle, the school magazine of his former school. From 1888 onwards essays began to appear under his own name in literary magazines like St James's Gazette, the National Observer and The Yellow Book. The National Observer, initially named The Scots Observer, had a number of other illustrious contributors including Kipling, Shaw, Stevenson and Yeats. Many of Kenneth's essays were republished as a collection under the title Pagan Papers in 1893 - the title representing an appreciation of nature rather than any form of sinister, medieval ritual! Among the essays which he wrote several were about a family of orphaned children - Edward, Selina, Harold, Charlotte and an unnamed narrator. These stories about the children and their guardians, referred to as the Olympians, have autobiographical overtones. They appeared in the first edition of Pagan Papers but were excluded from all subsequent editions. Kenneth wrote several further stories about these children and in 1895 a total of eighteen of these short stories were published in The Golden Age. Dream Days, a further collection containing eight, somewhat-longer stories about these children, was published in 1898.The Golden Age and Dream Days, although they have paled into relative insignificance beside The Wind in the Willows and are not widely read today, received huge acclaim when they were first published. Another short story with the title The Headswoman - a humorous satire about an executioner - appeared in The Yellow Book in 1894 and was later published as a stand-alone volume in 1898. It seems to have had an unspectacular reception and, in the end, was the only book about adults for adults which Kenneth wrote. In this period Kenneth moved house several times - to 65 Chelsea Gardens around 1886, to 5 Kensington Crescent in 1894 and to 16 Durham Villas in 1899. He also spent many of his holidays in Cornwall in these years, the seaside town of Fowey being one of his favourite resorts there. In 1897 Kenneth met Elspeth Thompson. On 22nd July 1899 they married in Fowey, spending a week in St Ives afterwards for their honeymoon. It was not a very satisfying marriage for either Kenneth or Elspeth. To make matters worse, Alastair, their only child, was born prematurely on 12th May 1900, blind in one eye and with an evident squint in the other. Unfortunately the Grahame's could never quite acknowledge Alastair's physical disabilities and average intellect. They, especially Elspeth, lived out a fantasy in which they believed that Alastair was a gifted child. Kenneth was promoted in 1898 to the position of company secretary of the Bank of England, a very significant position indeed, and, at thirty nine, he was one of the youngest men to ever hold that position. Although he was a keen sportsman at school and enjoyed walking and boating throughout most of his adult life, he did not have good health. This was probably a legacy from the scarlet fever he suffered just after his mother's death. In latter years at the bank Kenneth was absent for lengthy periods owing to illness. In 1903, in a bizarre incident, a stranger entered the bank’s offices in Threadneedle Street, asking to see the Governor. In the Governor’s absence Kenneth, in his role as company secretary, met him. The two exchanged a few words of introduction and then the stranger produced a pistol and fired off a few shots. Fortunately Kenneth was unhurt. Kenneth worked on in the bank for a few years after the "gunman incident", But his health problems together with a general disenchantment with the bank prompted him to take early retirement in June 1908. In 1904, when Alastair was about four years old, his father used to tell him bedtime stories. Some of these stories were about a Toad, and indeed they were the foundation of the latter chapters of The Wind in the Willows. Shortly after the period in which Kenneth told these bedtime stories he holidayed alone and wrote further tales of Toad, Mole, Ratty and Badger in letters to Alastair. (These letters were preserved by Elspeth and published in First Whispers of the Wind in the Willows a few years after Kenneth's death.) After Kenneth’s retirement from the bank the Grahames moved from Durham Villas to an old farmhouse in Blewbury near Didcot. Life moved at more relaxed pace and Kenneth had time to complete The Wind in the Willows. Surprisingly, the first publishers rejected it, and it was not until October 1908, after several rejections and some pro-active campaigning by President Roosevelt in the United States, that the book was finally published by Methuen and Co. 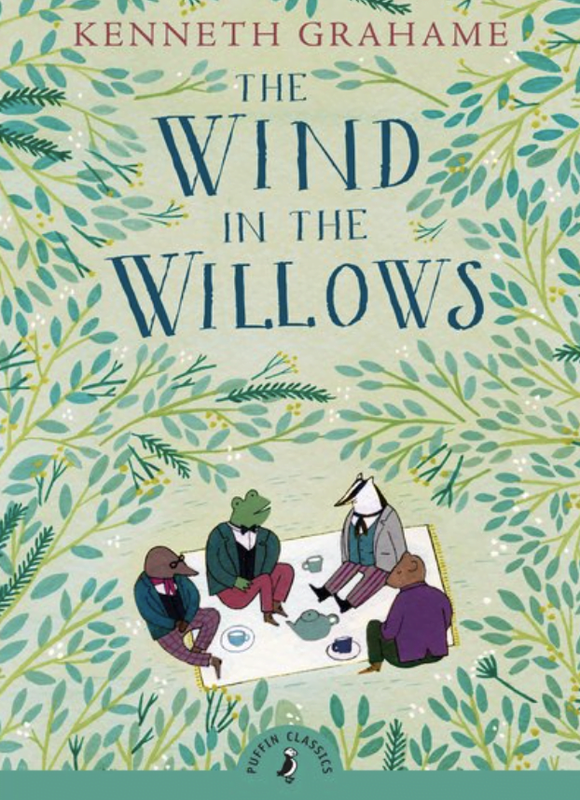 The critics, who were hoping for a third volume in the same style as The Golden Age and Dream Days, did not give The Wind in the Willows much praise. The majority gave it a negative review. The public loved it, however, and within a few years it sold in such numbers that many reprints were required. The rest, as the saying goes, is history. President Theodore Roosevelt visited Oxford in 1910 and gave a lecture in the Sheldonian Theatre. The President of Magdalen College arranged the lecture and, in response to a question on whether there was anyone he’d like to meet, Roosevelt asked to see three or four people including Kenneth Grahame and Rudyard Kipling. Kenneth travelled down to Oxford to attend the lecture and spoke with Roosevelt afterwards. The success of The Wind in the Willows was tempered, however, by Kenneth’s domestic problems, especially those concerning Alastair. Although the Grahames attempted to live out a fantasy surrounding him, as if he were a gifted, intellectual, lovable child, the truth was somewhat different and, when he began to attend school that reality became evident. As his schooling progressed he became more and more of a misfit and the struggle to reach the academic expectations that his mother, in particular, had, became an unbearable burden. After unsuccessful spells at Rugby and Eton, he attended Christ Church at Oxford. On May 7th 1920, in his second year there, he took an evening walk from Christ Church to a level crossing on the railway line between Oxford and Wolvercote. He was found dead on the tracks the following morning. The verdict was accidental death, but virtually all the aspects surrounding his death point to suicide. The Grahames were devastated. After the funeral they spent a long time holidaying abroad – almost all of the following four years. Most of this time was spent in Italy. After The Wind in the Willows and, more so, after Alastair’s death, Kenneth wrote very little – just an occasional essay or introduction to a book. In 1924 the Grahames moved to Church Cottage in the village of Pangbourne. Pangbourne is quite close to Oxford and it would seem that Kenneth made frequent trips to Oxford. Strangely, there is little or no record of him visiting London again in these years. On July 6th 1932 Kenneth died at his home in Pangbourne from cerebral haemorrhage and on the following Saturday he was buried in Holywell Cemetery in Oxford in the same grave as his son Alastair. His wife Elspeth died in 1946.